Jonathan Rea has won 11 times at Assen and is currently on a seven-race winning streak at the Dutch TT circuit. Jonathan Rea will view this weekend’s fourth round of the World Superbike Championship at Assen as a gilt-edged opportunity to enhance his quest for a record fourth title. The Kawasaki rider leads the standings by 12 points from Chaz Davies after the first three rounds and Rea will be aiming to turn the screw at the iconic Dutch TT circuit, where he boasts a formidable record. He has won 11 times in total in the Netherlands and his unbeaten run at Assen stretches back to 2014. On Saturday, Rea will attempt to secure his eighth victory in a row at the ‘Cathedral’ as he closes in on Carl Fogarty’s benchmark of 59 career World Superbike victories. The 31-year-old, whose second win of the season at Motorland Aragon in race one last weekend was his 56th in the series, also has the chance to match Fogarty’s record of four world crowns in 2018. 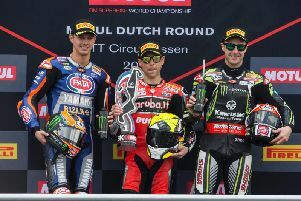 The fast and flowing nature of the Assen circuit lends itself to close racing but Rea has warned he has learned some ‘special tricks’ that will stand him in good stead for a last-lap showdown. “I really enjoy Assen and in the past it has been really nice to me. I spent a lot of time there with my previous team and it is a cool track,” he said. “The weather forecast is hot. It is a really flowing track. I am looking forward to it, and it provides good racing. It tends to be a group of riders together, three or four, all race. Rea made history last year when he became the first rider ever to win the World Superbike Championship in three consecutive seasons. The new regulations restricting the maximum revs allowable for 2018 have especially impacted the Kawasaki Racing Team, but Rea is now beginning to assert himself and Assen presents an opportunity for the Ulsterman to put some daylight between himself and his title challengers. Toome’s Eugene Laverty remains sidelined following his crash in race two in Thailand, which left the Milwaukee Aprilia rider with pelvic injuries. Laverty is currently at home in Northern Ireland as he continues his recuperation. The 31-year-old is aiming to be back in action next month at Donington Park.